I love challenging my children’s thinking and play provides fabulous opportimities to do so, but I also like to challenge their thinking during story times to seek out their understanding of the story. I use a variety of questioning techniques and ideas based on DeBono’s 6 Thinking Hats, Blank’s Levels of Questioning and Gardner’s Multiple Intelligences. Using the Multiple Intelligences approach is one way that I can ensure I am considering the individual learning styles of all my preppies and I am not just asking the obvious. Each week, along with all the other books we read, we have 1 book that we focus on and read everyday. This book provides the children with lots of opportunities to investigate the text and gain deep understandings of the story. 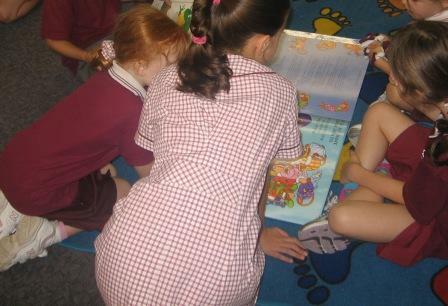 I also try to present the story and give the children opportunities to tell the story in different ways eg. using a felt board, story boards or puppets. Once they are familiar with the story, here are some of the ideas and questions that I like to use to challenge their thinking and problem solving. Retelling the story in their own words. Recording events in a story from the main characters perspective in a diary. My children record events at prep in their personal diary and are familiar with this form of documentation. Composing a letter to a character in a story eg asking the 3 little pigs if they are living in the same house or have they built new ones of their own, what they built the new houses out of etc. Where else could the story take place? eg. in Where’s My Teddy Could Eddy have lost his teddy in the park? Drawing a new cover page for the book. Draw/illustrate the main idea of the story. Sequencing the main ideas in the story and then asking what if the sequence was different eg. the hungry caterpillar ate the oranges before the apple. What did you like or not like about the story. How did you feel in the story? Did your feelings change in different parts of the story? eg. We’re going on a Bear Hunt. What would happen if one of the characters wasn’t in the story? eg. If some the animals didn’t get in the boat in Who Sank the Boat. or In The Gingerbread Man there was no fox at the river. What if there were additional characters in the story? eg. there were 4 little pigs instead of 3. Would the wolf be able to blow all the houses down? What would the 4th house be made from? Stop the story at a crucial part and ask the children to predict what is going to happen and how the problem could be solved eg. The Light house Keepers Lunch How can they stop the seagulls attacking the picnic basket? Acting out a play to show the main parts of the story eg. The Rainbow Fish and sharing out his scales How did he feel before/ after. Act out what happened to the characters when the story was over eg what did the bears do when Goldilocks ran away from their house. How did they feel? How did Goldilocks feel? Share your favourite part of the story and why you like it best. 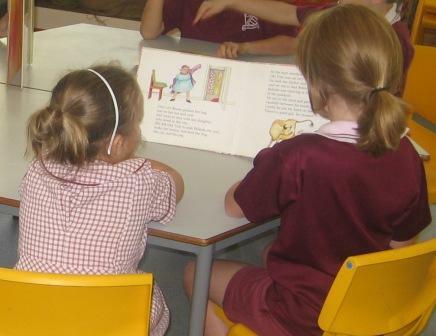 Whilst it is important that children develop visual and auditory memory skills, and stories are a great way to develop these. A whole new world is opened up to them when we also ask some different questions especially if we want our children to be thinkers and problem solvers.